Scattered throughout the world are quite a number of mountains with the peculiar name of Sugarloaf. Canada has several; the U.S. has more than 200. The name comes from the loaf-like shape that sugar was once molded into for shipment. The best known Sugarloaf, of course, is in Rio de Janeiro. 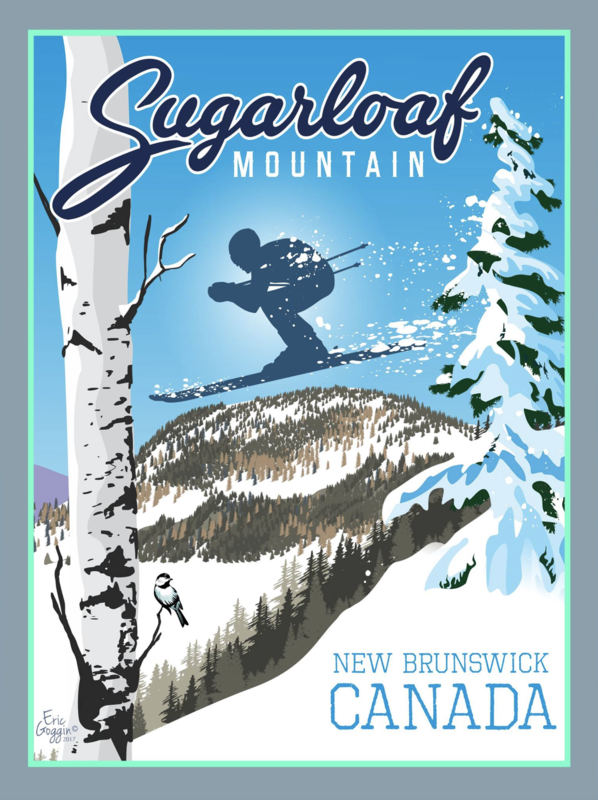 But the Sugarloaf Mountain that stands out for me [no pun intended] is in my hometown of Campbellton, New Brunswick. The heavily treed 922-foot sentinel is at the edge of town, about a mile or so from Duncan Street where I grew up. My south-facing bedroom window provided a great view of the mountain. From a cozy bunk bed, the Sugarloaf was the last thing I saw at night and the first thing in the morning. If I got up early enough, I could see the rising sun illuminating the top of the mountain, then the rest of it. There was something magical about our Sugarloaf and I thought about it a lot. I thought about the bears and raccoons that made the mountain their home. But mostly I thought about the two large, white-on-red crosses on the north face. Like a magnet, I was drawn to them. They were fascinating and to a kid like me, a bit frightening as well. 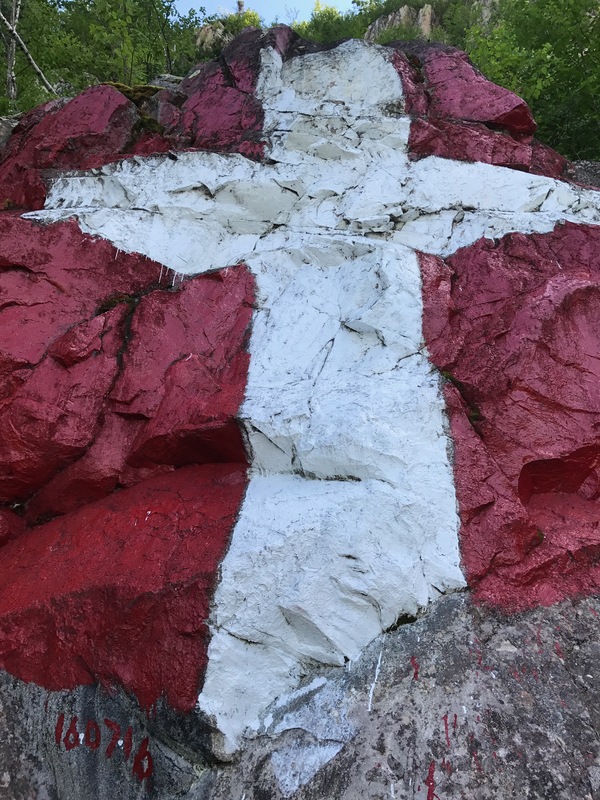 The monuments — because that’s what the crosses have become — were the work of a local painter who thought outside the paint can. More on him later. After my father, Byers, bought a pair of binoculars — we’re talking early 1960s here — I got to see those beautiful jagged cliffs up close. And those crosses! Man! Back to them again. That was a ‘wow’ moment when they came into view … so big and clear, they were. It was as though I was standing right in front of them. When I lowered the binoculars, I quietly wondered if I’d ever make it to the top of the Sugarloaf. It seemed so high and so dangerous. 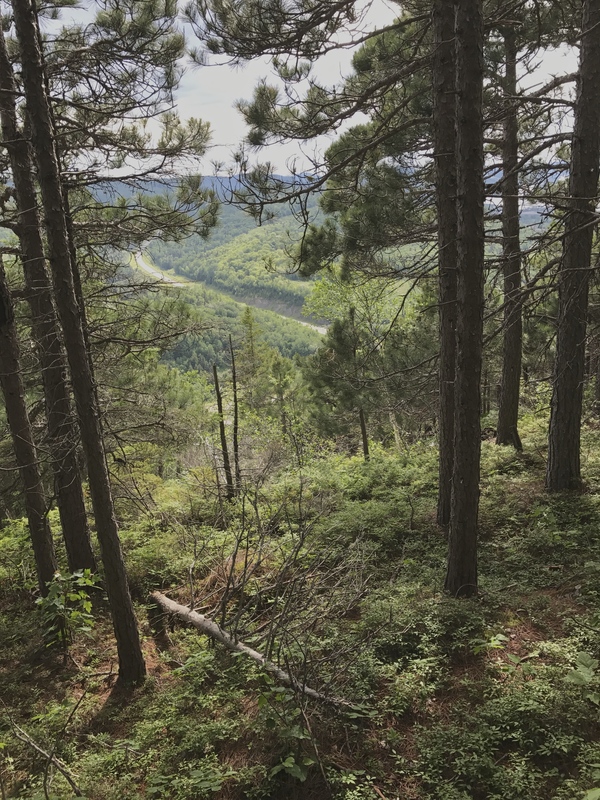 In my teenage years, I finally hiked the rugged path that snakes up Sugarloaf’s eastern slope, standing proudly on the summit. I’d climbed Mt. Everest. So I was always fascinated with Sugarloaf Mountain … and it’s still that way today. And here I am, turning 70 in 2019. The mountain has given both joy and sadness; joy when I see it, sadness when I leave Campbellton. Well, see for yourself … click on the photo to see a spectacular image that’ll fill your screen. Take another look at that aerial. Know that some well-known folk have walked Campbellton’s streets including former Quebec Premier Rene Levesque, pop-singer Patsy Gallant, country singers Brenda Best and Rik Reese, a handful of NHL players, NHL Hockey Hall of Fame broadcaster Peter Maher, Canadian Tire CEO Stephen Wetmore … and Charlie Van Horne, one of Canada’s most colourful politicians who had that bridge — the one in the photo — named after him. 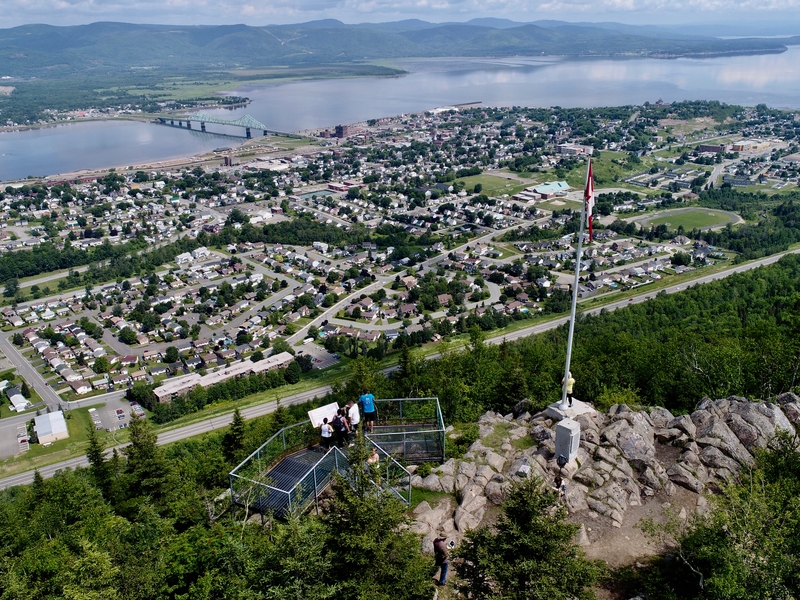 The flag atop Sugarloaf Mountain has become a much-loved icon in Campbellton. When the wind blows, it seems to wave ‘hello’ to no one in particular. The flag is many things … from a weather beacon [showing how strong the winds are] to a gentle reminder to those below that it would like a little company. The flag is also a powerful piece of Canadiana … proudly flapping in the wind. It only reminds people where they are, but what the country stands for. Having a flagpole on top of the Sugarloaf was the brainchild of RCMP Corporal Stephen Dibblee. The officer wanted to do something special to honour the three slain Moncton Mounties. On Tuesday, 17 April 2018, a combination of strong winds and an ice storm brought down the flagpole, snapping it in two. Within hours, Dibblee — now based in Ottawa — was on the phone with officials at Sugarloaf Park to make arrangements to put up a new pole. They say that when it comes to getting things done, people will either find a way or find an excuse. Dibblee and officials at Sugarloaf Park found a way and it didn’t take them long. A new flagpole was erected by park workers on Friday, 25 May 2018. It’s a few feet shorter than the old one. Photoshopping 1865. 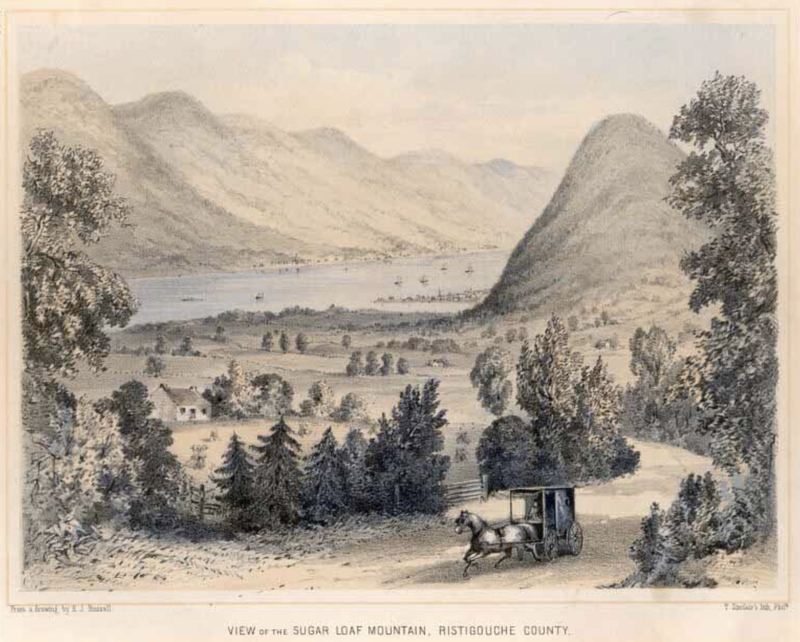 Edward John Russell’s view of the Sugarloaf with rather massive Laurentian mountains looming on the Quebec side of the Restigouche River. [Courtesy of the John Clarence Webster Canadiana Collection.] Click to enlarge. 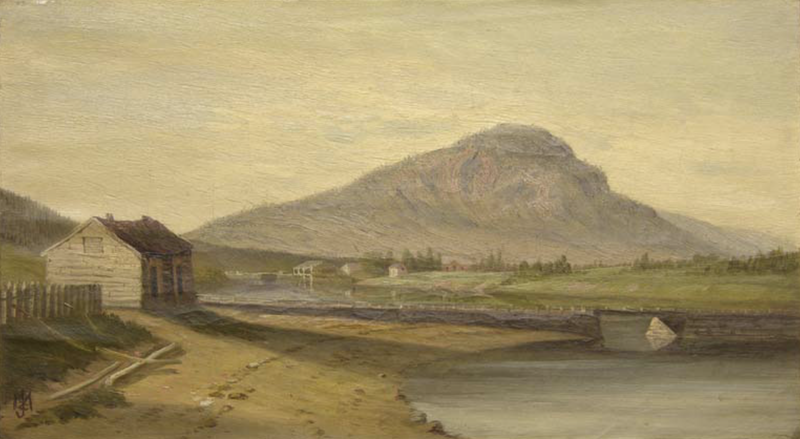 “Unspoiled Paradise” … an 1879 painting of Sugarloaf Mountain by John Christopher Miles. [Courtesy of Donald McAlpine.] Click to enlarge. 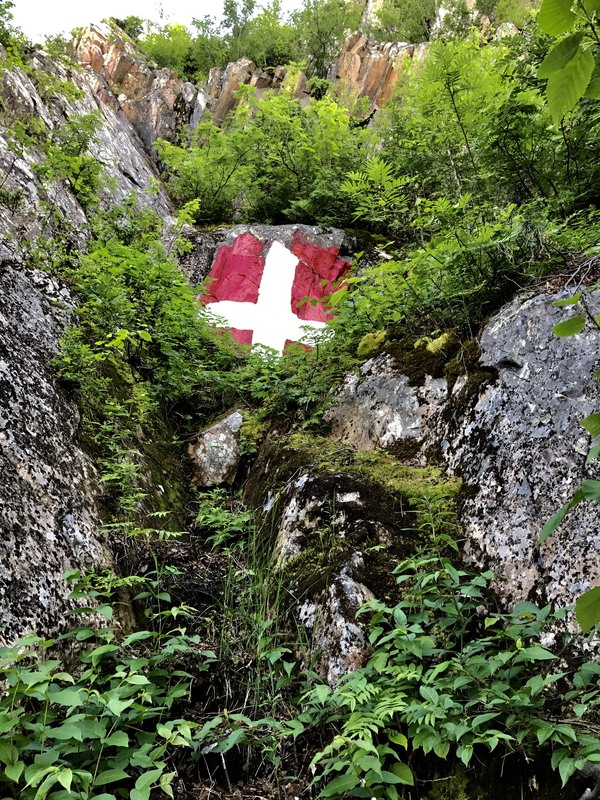 Like warning signs, a pair of crosses is the focal point of the face of the Sugarloaf, a silent tribute to two sisters who plunged to their deaths in the fall of 1924. 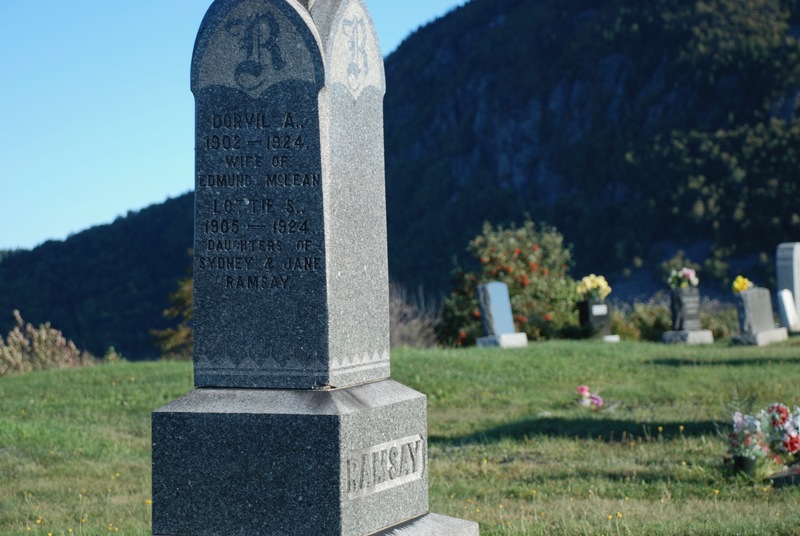 Dorvil [Ramsay] McLean was 22; Lottie Ramsay, 19. No one knows why the girls chose to make their way down the face of the mountain. It was mid-November, late afternoon and a light blanket of snow had covered the ground. As well, there weren’t nearly as many trees on the mountain as there is today. Tracks in the snow led searchers to the edge of a steep cliff. The searchers called out … but there was no answer. The silence was a huge red flag. This was no longer a rescue mission but a recovery mission. Climbing down the front of the mountain is treacherous at the best of times. It’s terribly misleading because the trees and shrubbery give one a false sense of security. One moment you’re standing on solid ground; next, you’re stepping into thin air … and down you go. Could it be that one girl slipped, fell and her sister tried to grab her? No one knows for sure what happened. It’s also not known if anyone heard their screams. Given information on the two death certificates, it appears the young women died quickly: massive head injuries. The bodies, discovered next morning by a police officer, were carried down in blankets. It was a terribly sad day for people in the tightly knit community. The Ramsay girls stood no chance of surviving the fall. [Photo by Author] Click to enlarge. Doucet painted the crosses to honour her uncle, Charlie Thomas, who had painted them a number of times, starting in 1967, Canada’s Centennial Year. Thomas, the founder of Restigouche River Outfitters, died in 2015. 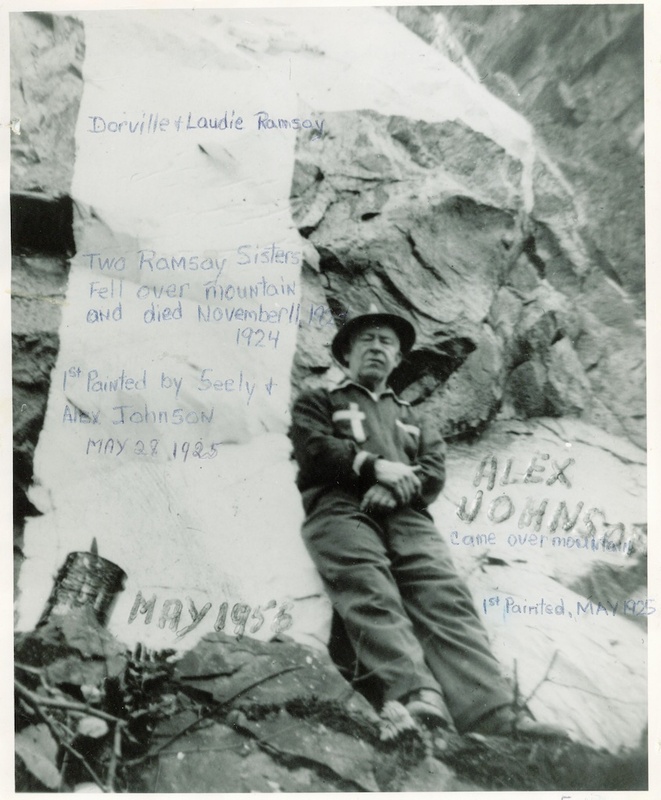 It was Alex Johnson’s idea to climb the mountain and paint the crosses. The Johnson brothers got a helping hand from their parents who owned a paint store. A personal keepsake Angie will treasure forever is the safety harness her father used to paint the crosses. Johnson, a founding member of the Royal Canadian Legion in Campbellton, died in September 1997. The man who took it upon himself to help bring some closure to the tragedy was 98. Alex Johnson is also buried in the Campbellton Rural Cemetery. The painted crosses have not only paid tribute to two lives but probably saved many more — thus becoming not just a monument, but a positive legacy. Scattered throughout the Sugarloaf are hundreds of names and initials chiseled in stone. The mountain has become a giant scratch pad. Here are some names at a spot I call the ‘second lookout’ [several hundred feet west of the main lookout]. 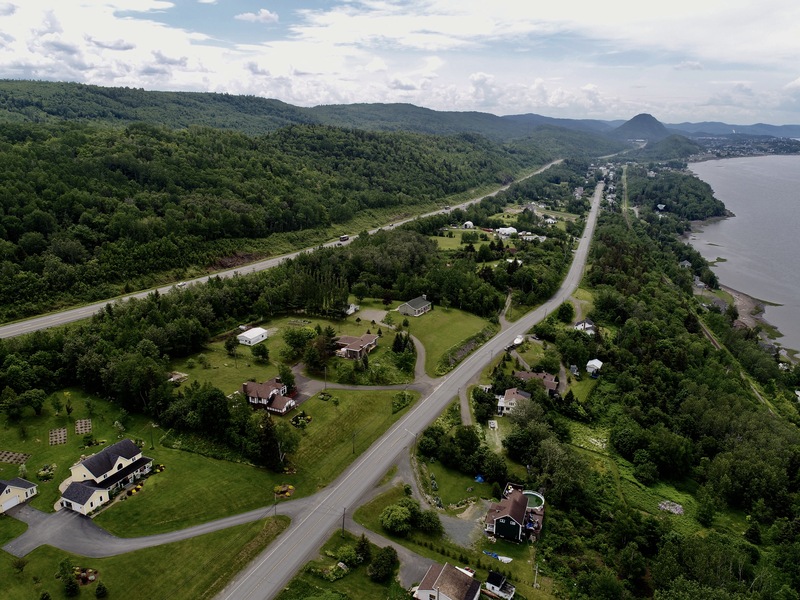 The location provides a great view of Atholville, Tide Head, and the Matapedia Valley. Can you make out Daniel Lagace …? One visitor shared that she sometimes makes her way to the remote lookout to meditate. I do too. It was at this same spot, 50 years ago, where, hidden under moss, I discovered some initials … and a date — 1917. Mark Ramsay has done one better. The Sugarloaf Parks official often scours the mountain looking for names, initials and dates from generations gone by. The earliest date he’s found? 1887. Mark’s grandfather was the younger brother of Dorvil and Lottie Ramsay. True. Back then, people did that. Today they use a marker. The hike to this part of the mountain is unmarked, but it’s worth the time and effort to make your way through the forest. Because there’s no path keep the city [which is to your right] in view … otherwise, you could wander all over the place. You know you’ve reached the end when you come across a cluster of tall pine trees. 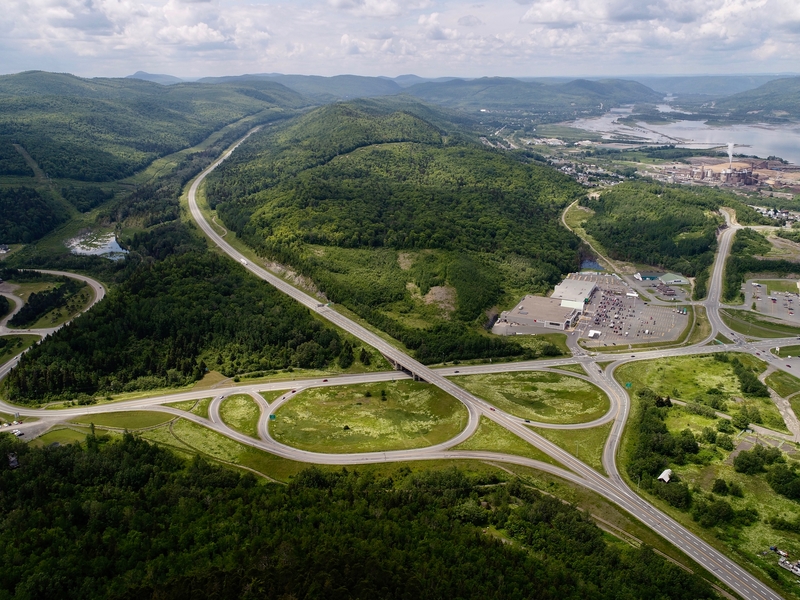 The ‘Pines,’ as I call the area, provide an excellent view of Sugarloaf Provincial Park, Matapedia Valley and a highway half-cloverleaf in Atholville. Click on the speeded-up video [2X] to get a birds-eye view of the Sugarloaf from east to west. Music: Reve d’Amour by the National Philharmonic Orchestra. Composer: Franz Liszt [1811-1886]. The clip runs just under one minute. Clicking the arrow will show the video in 720p quality. To view it in 1080p, which is 50 percent sharper — no problem. Just click on ‘share’ [top right] … then click on ‘original’ or MP4. The image will not only be sharper but larger. That’s one hell of a long time. 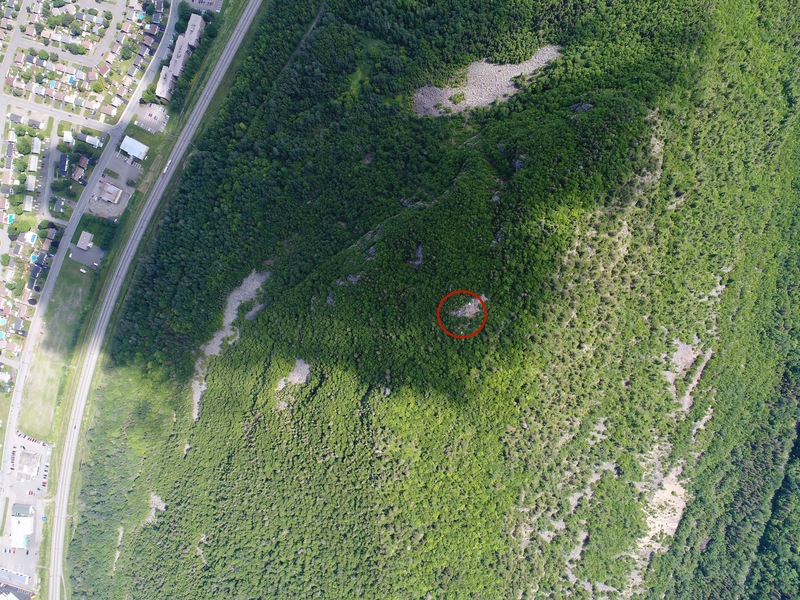 But that’s the age of Campbellton’s Sugarloaf — give or take 10 or 20 million — making it one of the oldest mountains in North America. According to geologists, the Sugarloaf is a retired volcano. That explains why it stands out from other mountains in the area since volcanic rock [cooled magma] is more resistant to erosion. 400 million years. Man. That’s when a day on Earth was 22 hours long and a year had more than 400 days. That’s also 200 million years before the dinosaurs showed up. To put things in perspective even further, it’s believed that homo sapiens [the earliest humans] have only been around a mere 2 million years. Suddenly I don’t feel old anymore. 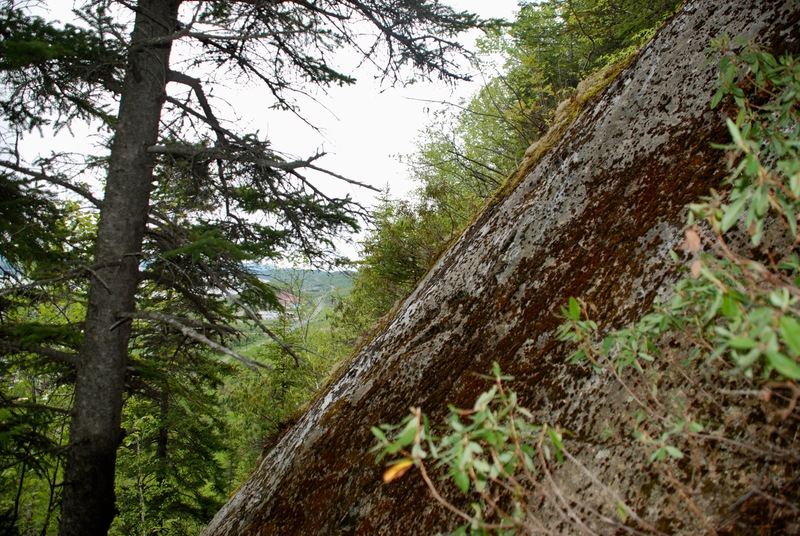 Another ditty from geologists … what we now know as Northern New Brunswick — including the Sugarloaf — was once south of the Equator. I can’t get my head around that: palm trees in Campbellton. “The heavily-treed 922-foot mountain …” If you’re from the area, that measurement may not have sat well with you. Many — myself included — were under the impression the Sugarloaf was exactly 1,000 feet. Mountain erosion doesn’t happen that fast, so what’s going on here? 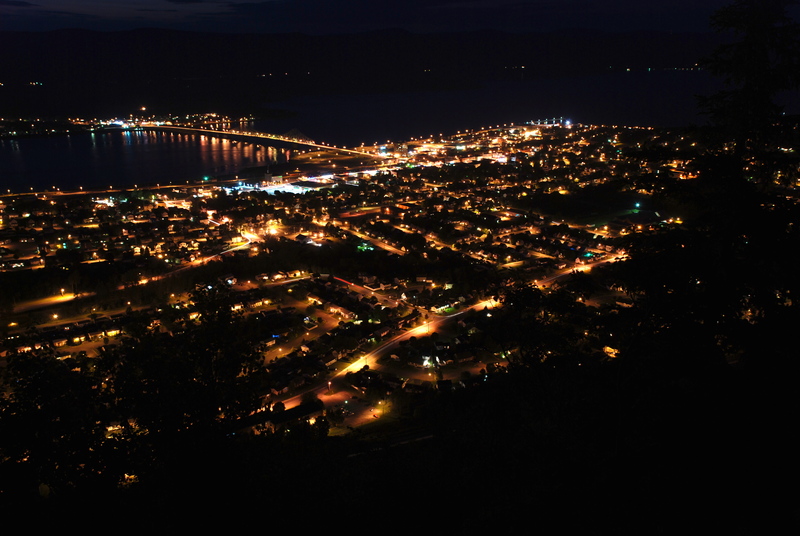 Those in the know maintain that the actual height of Campbellton’s mountain is 922 feet [281 meters]. Could it be that the 1,000-foot number refers to ‘feet above sea-level?’ I don’t know. … before 500-channel television, computers, video games, digital cameras, cell phones, drive-through restaurants, air-conditioning and 100 other things that supposedly made life easier. 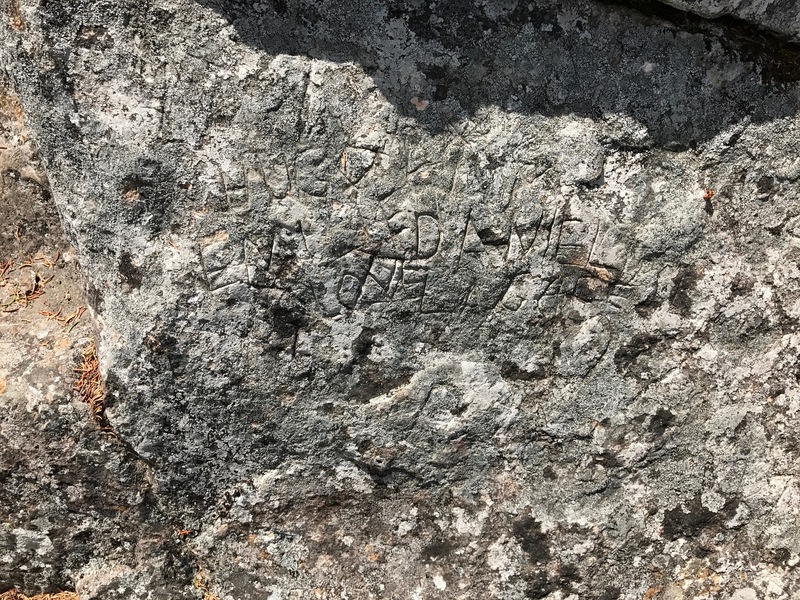 On a spring/summer/fall weekend in the 1960s, it was not unusual to see scores of people scampering about the summit of the Sugarloaf, snapping photos and chiseling their names and initials in the rocks. Here’s a collection of old photos [taken with an inexpensive Kodak Instamatic] from my sorties up the face of the mountain in August and September 1967. I paid extra for this film because it was colour. For American readers, that’s color. 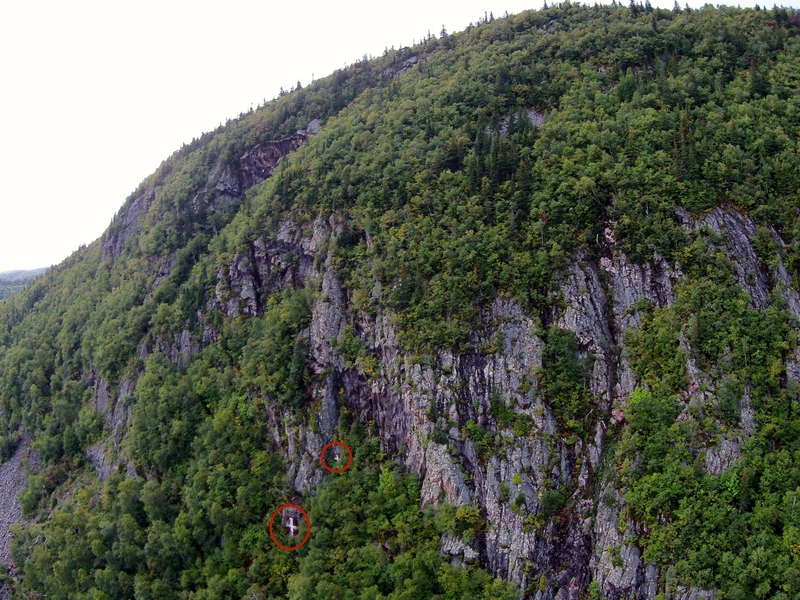 Somewhere on the north face of the Sugarloaf: Peter Irvine, Arnold Christopher, Oben Haley. The face? Our parents didn’t know what we were up to that day. Forget Waldo. Can you spot the Speed Demon soccer player? Arnold [author’s kid brother] and Author. When we were teens, we scampered up the front like jackrabbits being chased by bears. 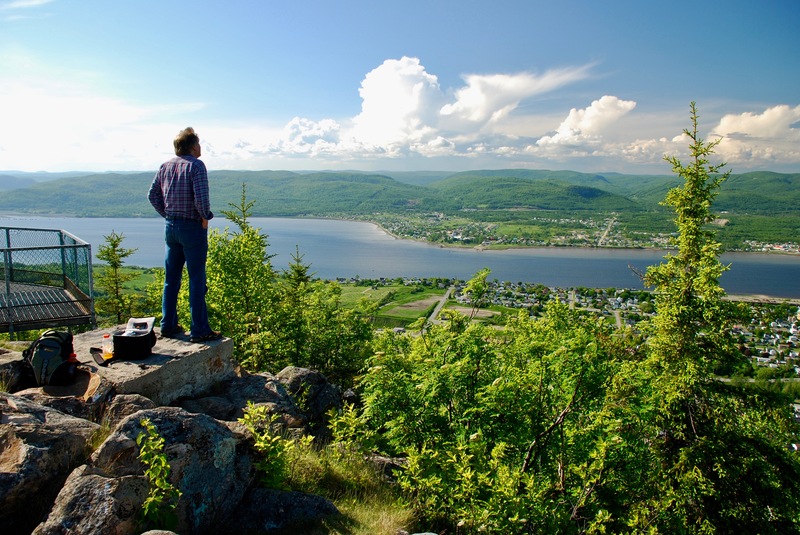 Now I take my time and enjoy the view and sounds of Campbellton. Truth be known, I stop every 75 feet or so because I’m out of breath. It’s slow-going. It’s me vs the mountain and the higher I get, the more exhausted I become — then it’s me vs the damn mountain. Because I take no ropes or hooks, I’m careful to avoid areas where there’s no safe way down. Vanity plays a part in this too, gotta admit. I continue to climb the north face because as long as I can do that, I know I’m not old. When hiking the front of the mountain, it’s easy to tell when one is getting near the top. and it’s not the flag flapping in the wind, or people talking. About 150 feet or so from the summit, one begins to notice old cans, plastic bottles, broken glass bottles, empty potato chip bags, sunflower seed bags, tissue papers, etc. It’s a little garbage dump. In years gone by, there was a public garbage dump at the very bottom of the mountain. Today it’s near the top. Park officials are now encouraging people to take their garbage with them when they go. Christmas 1968 – Author and sister Cheryl on a blustery day outside our family home at 90 Duncan Street … with a snow-covered Sugarloaf in the background. See how special that mountain is? I got dressed in a suit to have our photo taken in front of it. LOL. Courtesy of Eric Goggin. Click to enlarge. Feel free to submit your personal pics from the Sugarloaf … send to byronchristopher@shaw.ca [home] … or to byronchristopher@yahoo.ca [work]. September 12, 2011 … 80-year-old Simonne Boudreau and her daughter Monique. Simonne died 5 years after this picture was taken. She’d climbed the Sugarloaf when she was 60 … and it was her dream to do it again when she turned 80. Well done, dear lady … way to show those youngsters how it’s done. Sam Ross-Jerome from Gesgapegiag, Quebec. Photo taken by Author on 5 October 2018. The mountain has visitors 12 months of the year. Here’s local historian Irene Doyle. Some mountain trivia: At one time, my family owned a chunk of the old Sugarloaf. We got a cheque from a small company that owned a TV transmission tower on top of the mountain when the land was sold. A sturdy cable was dropped over the face of the mountain and that line allowed people in Campbellton to watch American TV programs from WAGM in Presque Isle, Maine. Back in the 1960s, cable TV was a big deal. We didn’t know it, but Campbellton was years ahead of some major Canadian cities. So was climbing the twin towers a big deal, albeit risky. Some, like Roland Parent [who was about 15 at the time] managed to climb to the top and sit on the cross-bars, enjoying the view. Not me. I got as far as 30 feet up and was shaking. August 1952 — a rest break from a blueberry picking expedition for the Oiselle family of Campbellton. A 6-year-old Louise Thomas is far right. Circa 1960 – a ‘Stand By Me’ Photo – Steve Hutchinson, Judy Savoy, Ann Savoy and David Hutchinson. David Hutchinson [now a resident of Montreal] again makes his way up the Sugarloaf. August 1, 2018. Florida-type weather [30+ degrees] and visitors from Florida: Henriette [‘Hank’] and Edward [Ted] Skoczen. Ted Skoczen was the structural engineer on the JC Van Horne Bridge . By the way, Henriette is 78, Ted is 85. Jacinthe Couturier of Rimouski, Quebec. August 25, 2018. Raise your glasses to this guy! Every Friday, Conrad Boissonnault SPRINTS up the Sugarloaf. His best time is under 12 minutes. October 5, 2018. July 2017. Left to right: Erica Cameron Furlotte and children Jack, Ava Paige, Katie … and Charlotte Hamilton Cameron. Meet Katie Leblanc of Campbellton with her bud, Lola. Photo taken in 2017. “Always worth the climb.” Carolyn Price, Kerry Edward Price, and Linda Kearney. August 2017.
Who needs a bench? A hiker [unidentified] ‘enjoys the moment.’ 2011 photo supplied by Louise Thomas. Guy Lebel and Bella pose for a selfie. July 2018. Half a century later, Louise Thomas still climbs the Sugarloaf. Here’s Louise [with shorts] with a friend from work on the old tower in the 1960s … and decades later, alongside the flagpole. 21 July 2018 was a scorcher and Campbellton native Cathy LeBlanc of St. Catharines, Ontario took a breather halfway up. Say cheese! Rose Beek of Campbellton, Jacinthe Couturier of Rimouski, Quebec, Claudette Couturier of Matapedia, Quebec and Monique Boudreau of Pointe-a-la-Croix, Quebec. August 25, 2018. Mr. Go Pro … Joey Holdershaw visiting from Ontario. Summer 2017. Above the clouds: Rose Beek of Campbellton and Monique Boudreau of Pointe-a-la-Croix, Quebec. Peggy O’Connell and Joanne Currie enjoy a sip of water … and the view! Three school teachers … 5 October 2018. 2016. Jane Allain, Sherley Lowe, and Bonnie Saxton. Jane has been climbing the Sugarloaf every year since she was 8. When she’s reached the summit in recent times, it’s a message to an old foe, Parkinson’s Disease, that she’s still on top. Kay Pitre and son Nick Brown visiting from Charlottetown, PEI. Phyllis Caron and Susan Caron on July 4, 2018. Two determined ladies. It was 28 degrees in the shade — and there was no shade. 1978. All the way from Hawaii … Victor and Sabrina Szabo. On a bone-chilling January 12, 2019, half a dozen Air Cadets from 349 Squadron Campbellton, under the supervision of a Sugarloaf Parks official, celebrated their 75th Anniversary by raising a new flag and keeping the old one … [which will now be put on display at their squadron]. Photo by Mark Ramsay. I agree. I’d say that 75 to 80 percent of those who climb the Sugarloaf are women. In March 2019, hiking buds Mariettte and Anne both celebrated the Big 6-0h. Friends presented them with a custom-made birthday cake of one of their favourite haunts, the Sugarloaf Mountain. The cake was made by Croissant Delice of Balmoral. So how about a world-class tourist site? It’s possible. But do people want that?? By world-class tourist attraction, I’m talking about a cable car up the face of the mountain — just like in the Alps, the Canadian Rockies and other places around the world. And at the very top of the Sugarloaf, a complex of chalets [great for honeymooners], revolving restaurant, a large, wooden platformed-viewing area with benches, shelters, fixed-binoculars, a souvenir shop, running water and toilets. Even a glass walkway, like they now have south of Jasper, Alberta. Why not? Glass-roofed cabins so people can study the stars at night. As well: an interactive, educational centre. And groomed walking trails across the top of the mountain — not as wide as the Terry Fox Trail — but just as classy. And along the spine of the Sugarloaf — near one of the existing paths — a wide, wooden stairway with metal hand-rails … running from the bottom to the top with resting spots with benches and sheltered lookouts along the way. Can’t say I disagree with Roy, but that’s my bias. I recognize that some wouldn’t want to have the site developed at all; in fact, some would prefer it to be the way things were 150 years ago. There’s nothing wrong with having diverse opinions. That’s all part of a democracy. One is also free to climb the face but, of course, it’s far, far more dangerous. If you try to climb the face, take your time [stop to rest], wear a helmet and take along a cell phone in case you get in trouble. And unless you’re an experienced climber, avoid those cliffs near the crosses. 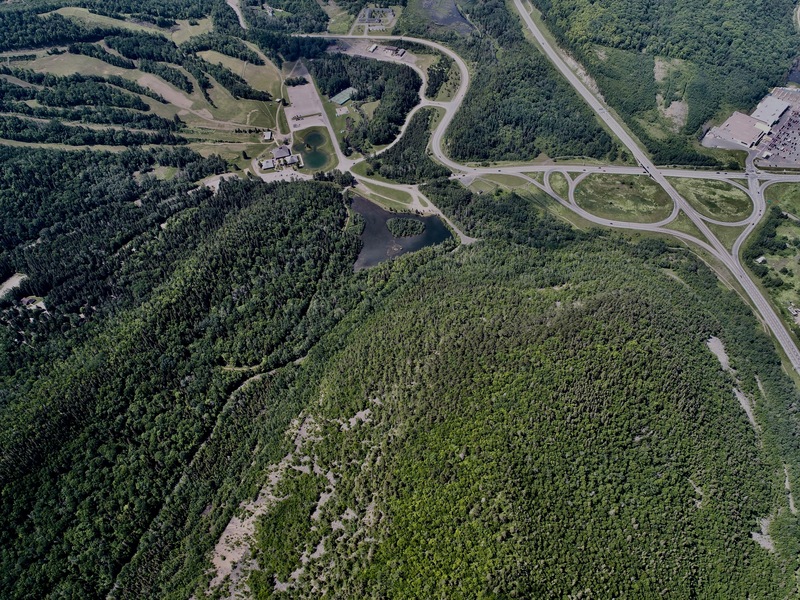 Speaking of democracy, put the matter to a referendum — and if the majority of people are in favour of further development of the Sugarloaf — then have a comprehensive study done [with input from professionals and environmentalists] to best determine how Charlie Van Horne’s dream can become a reality. Perhaps, in the end, it’s not affordable. Not doable. But … maybe it is. A study would sort this out. It would please me to no end to see more seniors on the top of the Sugarloaf and — for the first time — people in wheelchairs. If a trail and viewing area were properly developed, there would be far fewer injuries. 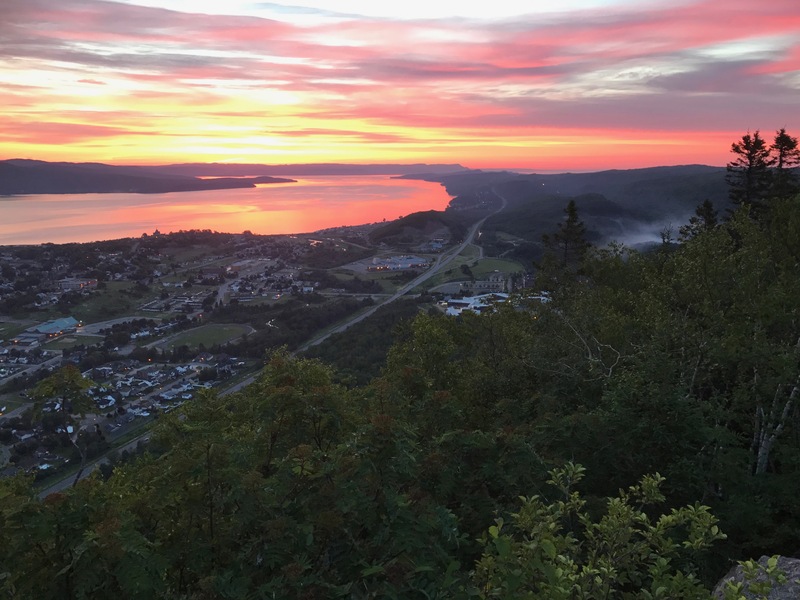 I can see tourists flocking to Campbellton to ride the cable car and enjoy the spectacular view and everything that goes with it. And that’s 12-months of the year. Who knows? With proper planning and management, a world-class tourist site with first-class amenities could become the number one employer in the Campbellton area. It’s certainly worth some consideration. Awesome article, hope you don’t mind I shared it with friends. So well-written, thank you so much. WOW!!! I am lost for words. Peter Irving. My brother hung with his brother, Sterling. You know as a teenager I don’t think I paid much attention to the Sugarloaf, although I too had a clear view of it out my back door at 52 Duncan. When I do make it back home now, I am in awe of its magical size. Well done! Good photographs and excellent commentary. You are very good at both. My hometown was Dalhousie N.B. and always remember Sugarloaf Mountain and those two white crosses. Thank you for sharing the history of the Mountain … so very well done. You should really consider putting this in book form. Would you happen to know about the cable car that was attached to the mountain to bring supplies up to the top? I have always seen it, but never knew what it was used for. I am assuming that it was for bringing tools and what have you to the top. By the way, love this story and as a fellow Campbelltonian, I miss the place as well. My maiden name used to be Claire Hachey; I lived in Atholville but was born in Campbellton, 1956. A death in the family had my brother and I living for a while where I could see the Sugarloaf Mountain and the crosses, maybe around 1964. The man and woman had an older son, maybe named Walter? Not sure, not sure his age either, I just remember being there, seeing that mountain daily. Such a special ‘affair’ with a beautiful mountain of memories old and new. Loved the photos, especially the night shot and the sunrise over the city. Yes, easily found the drone operator. Once again an incredible writing my friend. This is a great story. Thank you for the history lesson. It is truly amazing how much information we thought we knew about our hometown and how much we didn’t know. Being born in Atholville and raised in Campbellton, these ARE things we should have learned in school and not history of the US. Thank you again for the amazing article. Very interesting. You are so perfect at what you do, thank you kindly for sharing these beautiful memories. Needed a refresher course on the history of our Mountain … thank you. Thanks for the article. I learned a few things from it. I was told as a kid that the mountain was 999 feet tall, and so the geological monument was to give it the elevation to make it an ‘official’ mountain bigger than 1000 feet. But I don’t recall who said this, so chalk it up to an urban legend I guess. Also, Charlie Thomas was my brother. It is kind of you to mention his contribution. Lots of adventures “up the Sugarloaf” remembered. In the 1960’s, the western end of the Sugarloaf provided fill for the Campbellton approach of another landmark, the Charles Van Horne Bridge. I grew up on Christoper Avenue which was changed to Victoria Street and again to Aucoin Street. My favorite street name is Christopher Avenue which I think was named after your family. I never understood why the town wanted to change the name of the street in the first place. The house never moved but it had three different addresses. The house is still standing. My sister lives there. A house that my father built. The Sugarloaf mountain is in the back of the house. We had a clear view from our bedroom and kitchen window. We had a wonderful deck in the back of our house. I thought we had the best view in town. How I loved Campbellton but I had to grow up. Jobs were scarce and it did not hold a bright future for young adults unless you were lucky. I moved in 1966 to Toronto to work and further my education. In 1976 I moved to Chicago and presently I am retired and since moved to Michigan. I married and had two children. I brought them back many times when they young to be with their grandparents and play with their cousins. I wanted them to see and experience the place where I grew up. What I am mostly proud of is my father Alex Johnson and his brother Seely that they were the first people to paint the crosses on the Sugarloaf mountain. As a young child, I remember when my father would come home for supper after a long summer day of painting the crosses. I remembered he said that it was difficult to get the paint and ladder up the front of the mountain and that it was a rough climb. I remember when he first told me the story of the sisters and how they fell. It made me sad and I thought in my young mind “What if it was me and my sister?” “What would we have done?” I never thought that I would ever climb the mountain. Seemed liked like a very scary thing to do. I would change my mind. When I was around 11 or 12 our parents allowed us to climb the mountain with friends. Sometimes we might have had as many as 15 kids from our neighborhood that would be climbing the mountain on a summer day. It was always an adventure. Alex Johnson was born in 1898. That would make him 57 years old in that picture of him leaning against the cross. His brother Seely was older. He was not afraid of heights. He was a foreman of Bridge and Buildings for the Canadian National Railroad in Campbellton. His job required him to work on high bridges. Seely loved Campbellton! He was one of the founding fathers of the Canadian Legion and was an active member for over 75 years. He fought in the First World War. He told many stories of the war. When I took a closer look at the picture, I noticed that he documented the date that the crosses were painted and hand-painted a little story regarding the accident. That was truly my Dad. He wanted everyone to remember. I want to thank you for honoring him and acknowledging him and his brother Seely. Alex Johnson died a couple of months before his 99 birthday. Linda, I echo how proud it is to be a granddaughter of Seely and a niece to your dad. 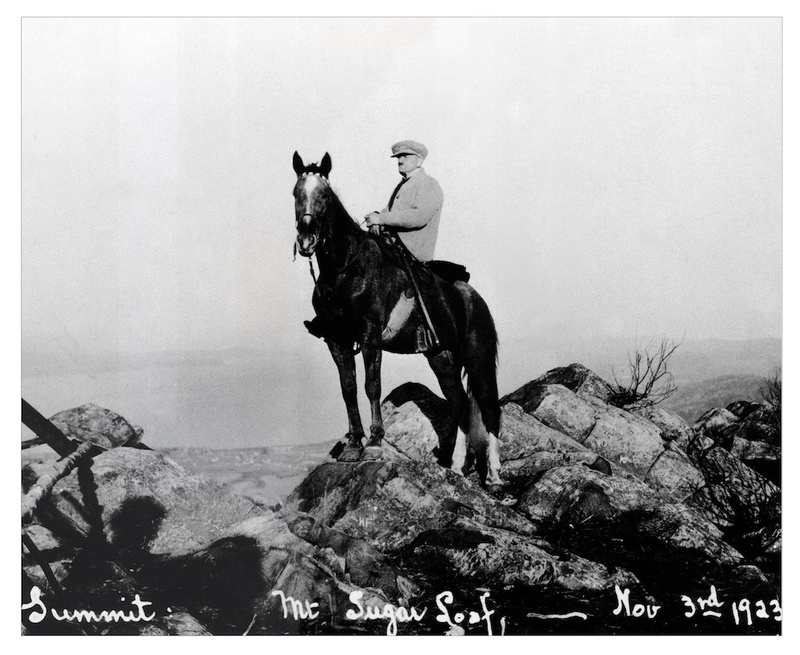 I came late into the family and the history of Sugarloaf Mountain. Cousin Shirley, along with Nancy my sister, and I paid our first visit to Campbellton to get reacquainted with our Johnson family. We had a very successful and loving visit with as many people as possible. The feelings that Sugarloaf Mountain gave me were a surprise. I love nature! I fell in love with that mountain and regret that time did not permit us to take a tour. Like you say, anywhere you go in Campbellton one is shadowed or maybe protected by the Sugarloaf. I hope to return again one day. I thank Bryon for his research and capturing the mountain’s history. I’m very grateful! Bravo!!!! Once again my friend you have captured me in your writings. You have a marvelous gift and I am thankful you share them with me … thank you. I didn’t realize the Bay of Chaleur moved so close to Campbellton! Nice shot. Those night time shots of Sugarloaf are terrific especially the one with lightning you didn’t take 🙊. I would like to make a correction. Alex was a founding member of the Canadian Legion anld actively participated in the Legion for over 75 years. Alex was a foreman on the Canadian National Railway. He was employed as a foreman over Bridge and Buildings. Seely was a taxidermist and served as a local weatherman. I really enjoyed reading your article. 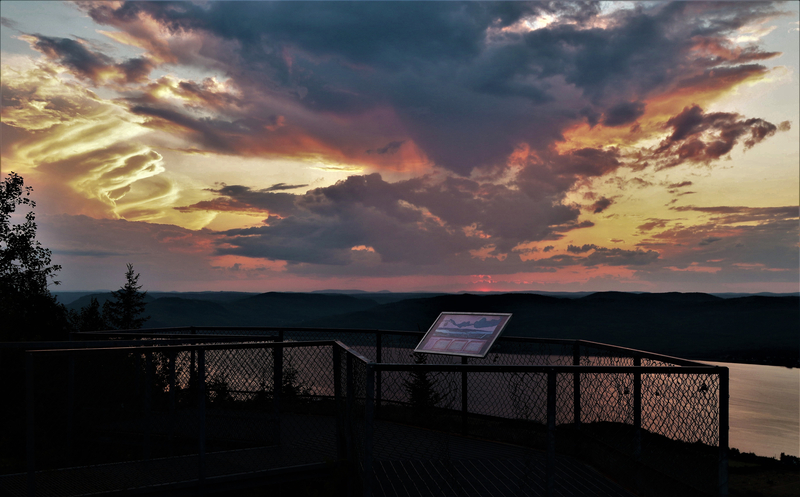 Campbellton and Sugarloaf Mountain, cannot talk of one without the other. Spent almost all of my years in that town, the last thirty years our living room window was facing the mountain. Could see the two crosses clearly and remember seeing them being painted. Was always fascinated by the different versions of the story of the two women’s fall. Thanks Mr. Christopher for sharing your personal feelings towards that landmark. Another well-written and documented story. You excel in your writing and I look forward to every article. Also looking forward to my visit to Campbellton in August. I just toured the retired volcano from your home town area. It was an amazing short journey which gave the sense of history and beauty. A sad event, those two girls that fell in 1924. My favourite pic is the painting of the hill in 1879. I can get the sense of unspoiled paradise with the painting. I sometimes feel a bit sad about the “lost paradise” all the now-populated places were 100 years ago. There are still many untouched places, I know, but just the same … what have we done … damn it. Thank you for a great article! Keep them coming. Well done! I really enjoyed this article, it brought back so many wonderful memories of climbing the Sugarloaf in the 60’s & 70’s. We also had a great view of the mountain from our house on Landsdowne … and even though I love my adopted province, there’s no place like home. Wonderful to accidently stumble on this article. I recognised the mountain from the first picture. Small world! I grew up at 53 Duncan (born 1945) and made many trips up the Sugarloaf from a path on the other side of the brook. Used to be a wonderful walk but the final trail to the summit was over huge boulders so I imagine the guy on the horse up there must have rode up there from somewhere else. Also the old painting is looking at the mouth of Walkers Brook into what we called Rabbit Toen. Brought back lots of wonderful memories of home. David, I remember your family but not you specifically. I was the Mann’s (Colin, Rhona and Wally) at 52 Duncan. Another good memoir. Entertaining and a window on the past! On August 3, 2013 I climbed the Sugarloaf 8 times non-stop. As soon as I reached the bottom, went straight up again. This was accomplished with no rests and with only one bottle of water. I was 63 at the time. Dave Jenson, a Halifax firefighter [originally from Dalhousie], did it 10 times that day. Dave was 33 years old and 25 pounds lighter. He had trained for weeks. Dave did it as part of a fundraiser for minor hockey. This is so well-written! The video and photographs are fantastic! Wonderful! You capture the true beauty of one of the greatest assets of this place we call home!